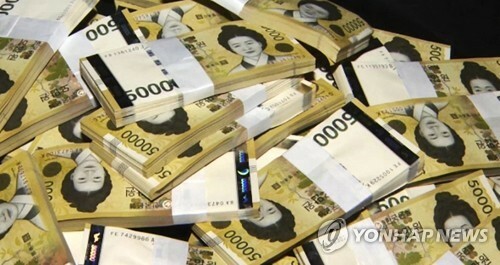 Home > Business > S. Korea’s money supply keeps rising in Aug.
S. Korea’s money supply keeps rising in Aug.
SEOUL, Oct. 17 (Yonhap) — The money supply in South Korea continued to rise in August on a steady hike in corporate lending, central bank data showed Wednesday. The country’s M2 totaled 2,651.5 trillion won (US$2.36 trillion) in August, up 6.7 percent from 2,485.6 trillion won a year earlier, the Bank of Korea (BOK) said in a statement. The growth rate of South Korea’s M2 had been on a steady decline since April last year but made a turnaround after hitting a four-year low of 4.6 percent in August last year. It has remained at the modestly high level of over 5 percent since the beginning of 2018. From a month earlier, the money supply edged up 0.6 percent in August, the BOK added. The central bank said increased corporate credit has led to a pickup in the money supply since the latter half of last year.